According to police who arrested Fairfax, Va., high school math teacher Fred Benevento, 47, in April during a drug sting, Benevento said the 13 plastic bags of crack cocaine in his car "came flying through his open window" and he "was just looking at them when the police officers arrived." A 39-year-old motorist in Bismarck, N.D., stopped in May by police for having illegal tinting on her truck's windshield, told them it must have been the work of a free-lancer who broke in and tinted the windows without her knowledge. Michael William Rahmer, 26, arrested for purse-snatching in Reno, Nev., in January, told police he was just testing response time to a crime report. He said he was impressed with how fast they caught him. Noble motive: Denver Garrett, charged with cocaine possession in Monterey, Tenn, in October, told police he bought it only to keep it off the streets and away from children. 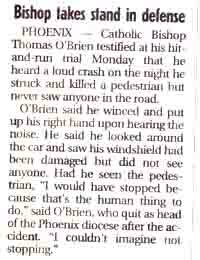 PHOENIX -- Catholic Bishop Thomas O'Brien testified at his hit-and-run trial Monday that he heard a loud crash on the night he struck and killed a pedestrian but never saw anyone in the road. O'Brien said he winced and put up his right hand upon hearing the noise. He said he looked around the car and saw his windshield had been damaged but did not see anyone. Had he seen the pedestrian, "I would have stopped because that's the human thing to do," said O'Brien, who quit as head of the Phoenix diocese after the accident. "I couldn't imagine not stopping." According to a follow-up AP article, on February 17th a jury found O'Brien guilty. "O'Brien, 68, is thought to be the first Roman Catholic bishop in U.S. history to be convicted of a felony." According to the article, O'Brien resigned from his post after prosecutors gave him immunity from obstruction charges for protecting Catholic priests accused of child molestation. 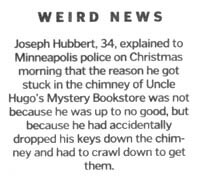 Joseph Hubbert, 34, explained to Minneapolis police on Christmas morning that the reason he got stuck in the chimney of Uncle Hugo's Mystery Bookstore was not because he was up to no good, but because he had accidentally dropped his keys down the chimney and had to crawl down to get them. In Los Angeles in February, Michael Marks, 25, raising an insanity defense to attempted murder, said he was drug-crazed at the time of the crime because someone on a balcony above him had spilled PCP on top of his head, and it must have affected his thinking. Recently in Muncie, Ind., Maurice Williams, 24, was charged with perjury after he told a judge he was not "Williams," even though "Williams" was tattooed on his back. Maurice said, "I can't see what's on my back. If there's some tattoos on my back, somebody's been bothering me when I'm asleep." In July a 27-year-old man who was arrested after allegedly trying to rob a Bank of America in Enid, Okla,. told police he merely intended to help repay the national debt. Jonathan Powell, 17, was convicted in April of sexually assaulting a college student in Iowa City, Iowa, after his DNA was found in several places on her body. Powell explained the DNA by saying that he had merely bumped into the woman accidentally while jogging and had become so "entangled" with her that he was unable to free himself for about "45 minutes."